Hello, everyone. I thought I'd come and join you, while the phantomoftheopera.com site isn't working properly. I'm interested in how Leroux changed the geography of the Opera House lake to suit his own purposes. My understanding of the real lake is that it is circular(? ), with vertical walls, and is full of pillars holding up the vaulted ceiling, and carrying the weight of the building above it. There are 5 levels of cellars below the stage, with the lake under the lowest one. Leroux said in his prologue that Philippe's body was found "on the shore of the underground lake. "* That's the first clash with reality, because Garnier's concrete tank doesn't have 'shores,' it has walls. *My quotes are taken from the Ribiere translation. Christine's description of her descent to Erik's house says: "The darkness had given way, all around, to a pale blue light. I saw that we were at the edge of a lake, whose leaden waters stretched into the distance, into the night; and on the illuminated shore was a small boat fastened to an iron ring." I've only seen pictures of the real lake, and the Google video which is linked elsewhere on this forum. It's not really that big, but okay, if not floodlit for cameras as it is on the google site, it might have seemed to Christine that it "stretched into the distance." The word 'shore' to me suggests something like a beach, but evidently that's not what is meant here, because of the iron ring. The lake has some more solid edge to it, like a quayside. That could be consistent with the real lake. I don't know where the 'blue light' came from, but perhaps it was a bit of 'Erik magic' to impress Christine. Or maybe she'd been drugged and/or hypnotised for the journey down, and wasn't seeing clearly or remembering properly. Later, during Christine's 2-week captivity in Erik's house, she said "he took me walking along the banks of Lake Averne and rowed me across its leaden waters." The real lake doesn't have banks suitable for walking. You could row across it, but this would entail a lot of dodging pillars. Incidentally, this is the first time we have heard the name "Lake Averne." It gets mentioned once more, in a later chapter, when the Persian says it is Erik's name for the lake. Now consider the journey of Raoul and the Persian into the depths. Leroux confirms that there are 5 levels (mezzanines) below the stage. At one point, the Persian guided Raoul to the lowest level (where they encountered the rat catcher). Having gone to one side to dodge the rats, they "made their way from the sides back to the area just underneath the vast mezzanines. They were standing right at the bottom of the 'tank' and at an exceedingly great depth. When the Opera House was originally built, the earth had to be dug out to fifty feet below the level of the river that ran under that district of Paris. All the water had to be pumped out. ... Eventually a lake was allowed to form outside the 'tank'." So this is where Leroux diverges from reality. The real 'tank' contains the water. Leroux's tank keeps it out, and therefore his lake, outside the tank, can be as big as he chooses to make it, with whatever features he cares to give it. (Although possibly a geologist or civil engineer might have an opinion about how big such an underground lake could be, before that whole section of Paris collapsed into it.) There must be access routes from inside the Opera House to the edge of Leroux's 'outside' lake, to account for the comings and goings of Erik and others. But fan writers who struggle to make the 'real' lake match up with 'Phantom' fiction might find it easier if they used Leroux's fictional lake instead. Yes, you've summed it up pretty well, Mary, I don't have much to add... Leroux is a master at taking smidgeons of reality and blowing them up into glittering illusions. It's also worth noting that, because the real lake is below the 5th mezzanine, and Erik's house adjoins the lake, we tend to think of the house as being at the "bottom layer" of the Opera House. However, when Raoul and the Persian are trying to rescue Christine, they go from the 3rd mezzanine, through a hole in the wall and down a drop of "a few yards" - not a killing fall, maybe 10 or 12 feet? So that puts them about the level of the 4th mezzanine, and they are now in the torture chamber, which is on the same level as Erik's house. Say the surface of the lake is a foot or so below Erik's floor level, it is well above the depth of the 5th mezzanine. This is consistent with Leroux's fictional statement that the water was pumped out of the 5th level, and also works with the idea of letting the lake water into the cellar below the torture chamber. So although Leroux changed the "geography" of the cellars, once he'd done it, he appears to have been consistent within his fantasy creation. Ah, but a real lake is just so much more interesting to write about, with oodles of possibilities! Geologically it's possible to build over a lake. I've always mentally envisioned massive support columns going down into the bedrock, with arches above, to support the foundations of the building. At some point the bedrock could rise above the water level, thus giving a "rocky shore." Note that it works like StreetView. If you click the arrows, you can travel across the water, and from the ladder at the end, you can turn down another passage. Massive support columns, as Riene describes. 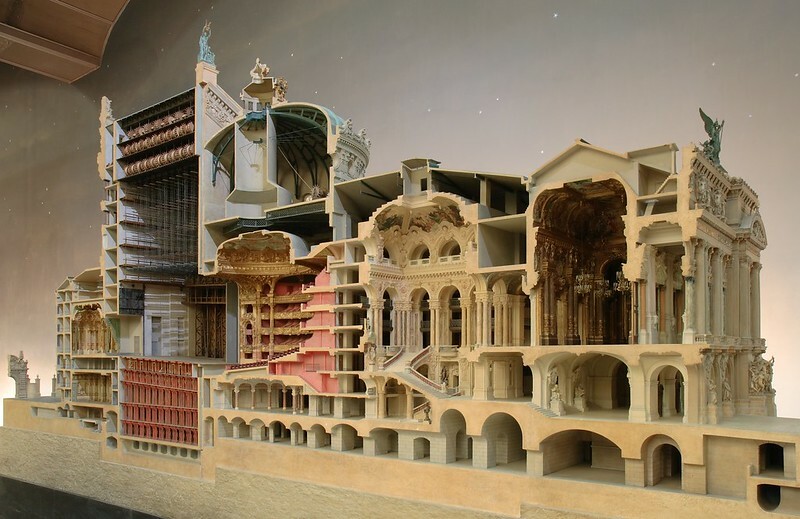 I think I've seen that image of the cut-away Opera House before, Mary, but if so it's been many years. Thank you for posting it! The Google view of the lake made me laugh out loud. How perfect, and how awesome is that? I can't resist bumping this, because yesterday I was in the presence of that scale model! And it's about 15 feet long! It's in the Museum d'Orsay in Paris. If you get there and want to find it, as you go in the entrance there are stairs going down, in front of you. Go down them to the lower-level gallery which is full of sculptures (including a copy of the Statue of Liberty, somewhat smaller than the original). Walk straight through the gallery and you'll find the model at the end. In front of it, there's a section of glass floor; beneath the glass is a smaller model of the Garnier and the streets and buildings surrounding it, so you can look down on the roof and figure out where Raoul and Christine went. And on one side are some model stage sets which were used historically in production design, in the pre-computer era. Am so envious, Mary. My Phantom obsession has been revitalized by a visit to Stockholm to see the Swedish production. Phantom is such an inspiration and catalyst for me - in all its forms. Never got around to visiting the Musée d'Orsay when I lived in Paris, so many other things to do, and the queues were long when it was new.